Don't be caught unprepared during a storm. April showers may bring May flowers but you need to make sure you are prepared for those showers. Spring is a time when everyone starts to get excited about the warmer weather, grass starting to get green, and flowers starting to bud, but the joy that comes from these things is all because of the rain. Here in Utah we all cross our fingers for a wet winter and spring to help with our hot dry summers, but have you ever thought about if you are prepared for those showers? Rocky Mountain Power recommends these tips to be prepared. 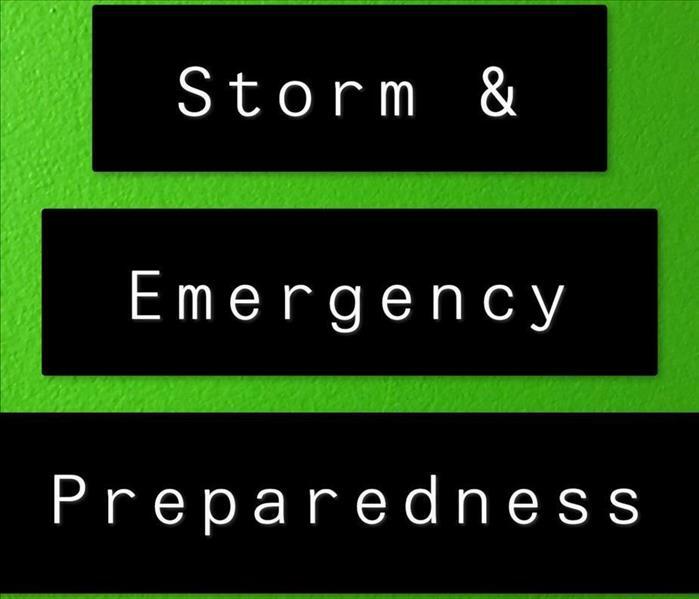 For more information on an Emergency Readiness Plan offered free of charge by SERVPRO Call Us today! Has Snow Melt Damaged Your Home? It’s a glorious time of the season when the weather starts to change from snow to sunshine and the temperature starts to rise. But if you have snow accumulation around the edges of your home it may not be time to celebrate. This is the time of the year when we start to receive calls from people who have water in their basements and they aren’t sure where it is coming from. You’ve checked and found no visible evidence of a leaky pipe or appliance malfunction and may be scratching your head in frustration. If this is the case you might have water damage from recent snow melt. Melting snow around the perimeter of the house can saturate deep into the soil and leak through the foundation and basement walls. Or if you have leaky roof that melting snow is coming right through your ceiling. You now realize you have a problem but what do you do now? Call SERVPRO of Provo and we will send one of our trained technicians to save the day! Using advanced extraction techniques, our technicians have the expertise, training, and certificates to help clear away water and mitigate loss. We use scientific drying principles and provide validation and documentation that your property is dry and the job is complete. We also utilize professional-strength cleaning, sanitizing and deodorizing products to clean and sanitize the affected water damage area for your comfort and safety. Follow these tips to prevent water damage to you home as the snow starts to melt. Remove the snow from around your home: You probably always shovel your porch and sidewalks but have you thought about the snow surrounding the edges of your house. Check your roof and gutters: Before the first snow hits inspect your roof and gutters for any damage. Also, be sure you’re your gutters are clear so the snow melt has a clear pathway off your roof. Clear snow from drainage areas: storm drains and catch basins can often get clogged with snow and debris. If you can do it safely, clearing snow from these areas can help keep water way from your home. Rearrange your storage: In case water does get into your basement be sure to keep valuable, chemicals, or anything else you’d like to keep dry off the floor; or in water proof plastic bins instead of cardboard boxes. Check your appliances: clear out space around your water heater, furnace, and other appliances. If possible, raising your washer and dryer off the floor could protect from water damage. Don’t try too much: getting on the roof at anytime of the year can be risky, even more so if snow is involved. Clearing your roof and gutters is important to prevent water damage, but be sure to use a professional to handle any dangerous situations. Did You Know SERVPRO Offers Commercial Cleaning? If you are the owner of a commercial business you probably don’t have time to worry about the common wear and tear that gradually soils your office. When grime, odor, and moisture challenges go beyond the scope of your regular janitorial staff, tag us in. Whether it’s removing an odor problem or deep cleaning your flooring or carpets, you can rely on us to make your work space look, smell, and feel it’s very best. Go ahead, Give us a call, Tag us in, We’ll make it "Like it never even happened." What About My Irreplaceable Items? 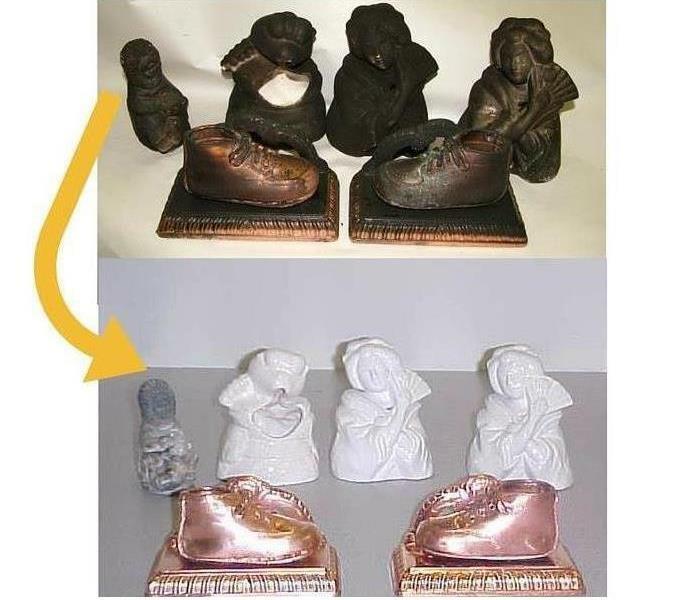 What once looked ruined have now been restored to perfect condition! A house fire in your Provo can be an overwhelming experience. It can be physically, financially and extremely emotionally draining. With the right insurance coverage, time, and rest, the physical and financial effects will eventually subside. Walls and floors will be repaired and furniture and appliances can be replaced. The most devastating of all is the damage done to those items that simply cannot be replaced. Most items that are destroyed in house fires can be repurchased, but what about things like photo albums, hand sewn quilts, family heirlooms, journals, or souvenirs from a memorable vacation? Those close-to-your-heart keepsakes are irreplaceable. The experts at SERVPRO are here to help. Our restoration specialists at SERVPRO are trained to restore almost anything. Soot, smoke, water and even sewage is no match for the expertise at SERVPRO. When your valuable documents, including photographs, are damaged by water or fire, extreme caution should be taken to help ensure the fire damage does not destroy the document. Although some documents may not be restored to pre-fire damage condition, SERVPRO of Provo can save a great deal and help minimize additional damage. SERVPRO of Provo will give you peace of mind when you need it most! Anyone who has paid the bill to heat their home in the winter knows the woes and expense associated with staying warm. In return this is why so many people to turn to their trusty space heater, but is your space heater “trusty”? Did you know upwards of 25,000 house fires and 300 deaths are attributed to space heaters each year? Follow these tips to keep warm and most importantly protect your family and home this winter. Proper placement of your space heater is crucial! Keep space heaters at least three feet away from anything that is flammable or can burn. This includes curtains, bedding, clothes, papers, etc. Select the appropriate space heater for the size of your room. If you are placing the heater in a bedroom or smaller area you only need a heater rated for your space. On the other hand, if you are heating a large area don’t expect to buy a smaller rated heater to heat the entire space. That leads to the over use and can cause the smaller heater to malfunction. Keep children and pets away from the space heater. This may sound obvious but many fires are caused be the heater gets covered or tipped into something flammable. Place your heater on a hard, flat surface. 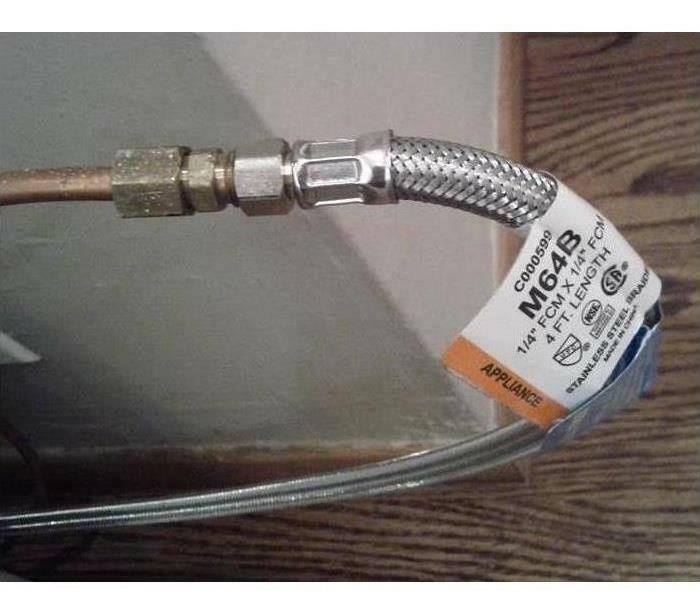 Most heaters have an auto-shutoff trigger on the bottom but its better to be safe than sorry. As a rule of thumb plug directly into an outlet. Do not use an extension cord or power strip, which could overheat and result in a fire. Use common sense and be careful so you don’t become one of the 25,000 fires a year caused by space heater. If you do experience a fire caused by space heater or anything else call SERVPRO of Provo. 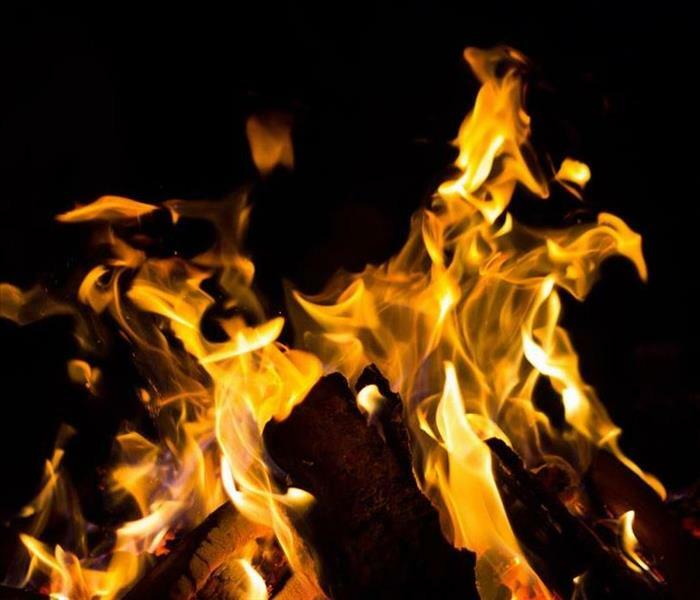 As Fire and Water Damage Specialists, we have the experience, the expertise, and the advance training that enables us to get your property restored quickly and thoroughly. A Water Supply Line Can Lead to Flooding and Water Leaks in Your Home. Most people see that SERVPRO is a flood cleanup and disaster mitigation company and think, "I live in Provo, I don't live by an ocean or pond or river so the chance of my house flooding is next to nothing." What most people don't realize is that most of the water damage caused by flooding calls we receive come from broken or leaking water supply lines. Supply lines are those thin hoses that run to appliances like refrigerators, dish washers, toilets, water heaters, clothes washers, etc. The quality and price of these hoses vary drastically. Most people opt for the least expensive option without knowing that cheap hoses need to be checked and replaced often. Sudden bursts and slow drips both can cause a substantial amount of damage which require flood mitigation and sometimes mold remediation. If you haven't checked you supply lines in a while, or ever, now would be a good time to do so. When your home has water damage from flooding or leaks, we have the expertise and equipment to properly restore your property. Our experience and scientific approach to water removal and water cleanup enable us to properly dry and restore your property. Hail Damage to Your Spanish Fork Roof? In 2016, the United States experienced 5,601 severe hail storms, as documented by the NOAA Severe Weather Database. Hail can range in size from the size of pencil tip to the size of a softball. Many homeowners are not aware of hail damage on their roofs. Hail damage to roof tops often times cannot be seen from the ground, and that’s a big reason why the idea of hail damage hardly ever crosses a homeowner’s mind. Although you cannot fully determine the amount of hail damage on a roof from the ground, there are some signs that a trained eye can point out and help determine if there may be more damage up top. Here are a few things to look for. Dented or damages shingles are what leads to a damages and potentially leaky roof. Some day you will never get a solid insurance claim without shingle damage. Hail damage is covered by standard home insurance in most states but coverage is applied in a variety of ways, depending on where you live, your insurer and how your policy is set up. The best way to find out about your coverage is to reach out to your insurance provider before the damage occurs. If you have a damaged roof due to hail that has caused a leaky roof call SERVPRO of Provo today to help mitigate water damage in your home. Nosebleeds are very common in both children and adults and can be caused by trauma to the nose or simple irritation of the mucus membranes. Do not make a nosebleed victim raise their head or lie down, as this can actually make the bleeding worse. Instead, pinch the nostrils closed for as many as ten minutes, allowing the broken vein in the nose to close. Approximately 88% of all cardiac arrests do not happen in a hospital or healthcare facility, and nowhere near a healthcare professional. A large percentage of cardiac arrest victims appear perfectly healthy just before their attack. It takes approximately 8-12 minutes on average for an ambulance to arrive on the scene of an emergency. 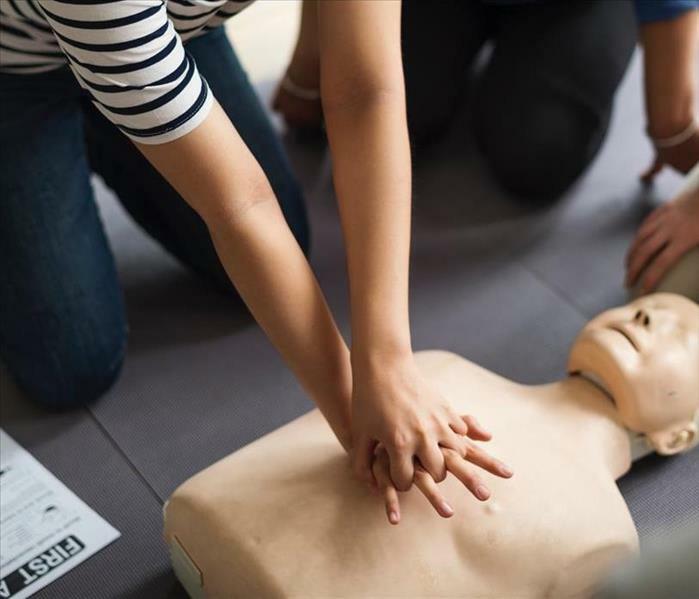 Bystander CPR could increase the victim’s chance of survival by as much as 300. Not to be confused with CPR, the Heimlich maneuver is supposed to help someone who is choking on a foreign object. First, ask the victim if they are choking; in an emergency situation, the person will usually not be able to talk. If someone is bleeding heavily, they will not be able to form a clot—and they could bleed out. You can stop the bleeding by putting pressure on the wound—ideally with a sterile cloth, although you can also use ripped pieces of T-shirt or anything else you have on hand. Raising the wounded limb over the heart will also help to slow down heavy bleeding. In 2016 there were an estimated 364,300 reported residential fire and 2,000 fire related fatalities. In the event of fire, TIME is the BIGGEST ENEMY and EVERY SECOND COUNTS! In less than 30 seconds a small flame can turn into a major fire. The most important thing you can do to prepare is have a Safety Escape Plan. First and foremost, make sure you have one working smoke alarm on every level of the home, as well as inside and outside each sleeping area. Have two ways out of each room, and the proper equipment to get out any upper story windows. Walk through each room in your home with your family and point out possible exits. Also, provide alternatives for anyone with a disability. Once you have established the exits, practice and show children how to get out of the house and check the door for heat before opening it. Know to crawl low to the floor when escaping to avoid toxic smoke. Practice dropping to your stomach and shimmying out under the smoke with your children. Make a plan to help pets evacuate safely as well if possible. Once you are out of the house, STAY OUT. DO NOT go back in the house. There could be unseen damage and danger. Call 911 immediately. Know where to meet after the escape. Your meeting place should be near the front of your home so firefighters know you are out. Practice, Practice, Practice your escape plan. It is recommended you practice at least twice a year. If you have young children it may require more than twice. Practicing can save the lives of you and your family. - Owners Libbie & Tom Hamman opened their first franchise over 38 years ago after they experiences not one but two kitchen fires. They have been leading the way since! -Home emergencies don’t wait for regular business hours and neither do we. SERVPRO of Provo provides emergency cleaning and restoration services 24 hours a day, 7 days a week—including all holidays. You can expect an immediate response time, day or night. -Our staff is highly trained in property damage restoration. From initial and ongoing training at SERVPRO’s Corporate Training Facility to regular IICRC industry certifications, rest assured our staff is equipped with the knowledge to restore your property. Our training program includes the following: IIRCRC training, Employee Certification training, E-Learning programs, and Continuing Education Classes. SERVPRO of Provo is ready to handle your loss whether it is a water loss caused from a leaky dishwasher in your home, or water loss in your commercial business caused by fire sprinklers throughout the entire structure. We at SERVPRO of Provo understand the stress a hardship in your home can cause and our staff is there to make it as easy as possible. Our technicians know it is your house but treat it with respect like their own. Our hope is to take that stress from you and make it “Like It Never Even Happened”. 3/28/2019 - Has Snow Melt Damaged Your Home? 3/26/2019 - Did You Know SERVPRO Offers Commercial Cleaning? 3/14/2019 - What About My Irreplaceable Items? 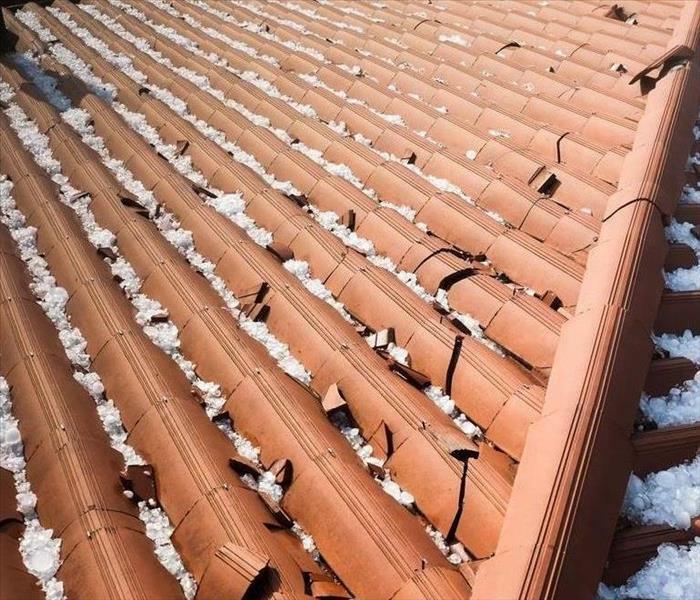 2/28/2019 - Hail Damage to Your Spanish Fork Roof?